660 Guitars launches the Patriot for 2016 adding another amazing guitar to their range of aluminium instruments. 660 Guitars launches the Patriot for 2016. 660 Guitars is an innovative new guitar start-up based in the US which is challenging our view of how guitars should be made. Created by builders Drew Emory and Myke Wilkers 660 Guitars have taken an alternative approach to the traditional art of crafting a guitar. With 660 Guitars the instrument body is constructed from aircraft grade aluminium and the necks from graphite and carbon fibre. Emory and Wilkers argue that traditional wood construction makes the guitar susceptible to movement, especially in the neck area, due to changes in humidity. The combination of aluminium and graphite/carbon fibre necks makes 660 guitars extremely robust allowing for some radical body designs. 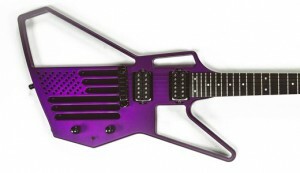 Certainly the radical designs have turned some heads in the guitar world! To see a little bit more about the construction process and how the guitars sound check out the video below. The company have recently announced that they will launch their latest offering, the Patriot, at NAMM 2016 in January. The Patriot from 660 Guitars harnesses all the manufacturing technology that you would expect from a quality hand made guitar. The Patriot has a radical and eye catching body design made from aircraft grade aluminium. The 25.5″ scale graphite and carbon fibre neck has been designed with a shallow oval 16″ radius, which should make this guitar great to play. The finish on the guitar is a resilient powder coat which is available in a number of shades. The bridge on the Patriot is a Tone Pro wrap-around bridge that is piezo loadable. The pickups are 16.50K Dimarzio Dominion humbuckers with ceramic magnets which are mounted on mini rails to allow for numerous user-adjusted tonal variations. Other features included smoked acrylic black glass for the rear cover plate and Hennessy NSL-7200 strap locks. Essentially this is a high end guitar with lots of features that should satisfy even the most demanding of guitar players. Certainly one to look out for at NAMM 2016. The 660 Guitars website is currently under construction but you can check out their Facebook page for more details.